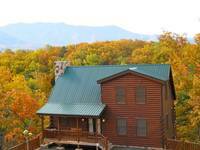 Are you planning a stay in the Gatlinburg or Pigeon Forge areas of the Smoky Mountains? 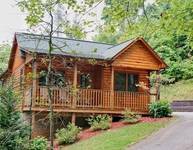 Browse all of the Gatlinburg Cabins and Pigeon Forge Cabins offered by Heartland Cabin Rentals in Gatlinburg, Tennessee. Click "More details.." by each property for a full details of cabin amenities, photos and avialability. The following cabins are available for your dates below. 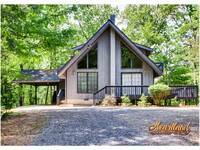 If you are having trouble finding a rental cabin that fits your needs, please contact us by calling (865) 430-9093 or Click Here to send us an email and we will respond promptly. Feel the love in the one-bedroom, two-bath cabin, Alone With A View, while you enjoy your mountain getaway. 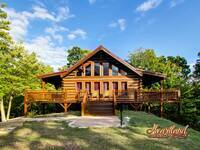 Sleeping four, this cozy cabin is complete with beautiful views and all the comforts of home. There is a king bed with a jacuzzi in the loft. You'll find additional sleeping arrangements in the bedroom with a queen bed. 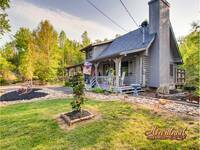 Swimming Pool and catch and release fishing pond access! No pets and no smoking allowed! The home features a fully-equipped kitchen and a washer and dryer for your convenience. The living room is complete with a gas fireplace, a pool table, a television with a DVD player, and plenty of seating for everyone. 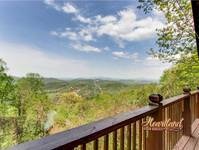 Enjoy the deck with a hot tub and rocking chairs for your enjoyment. There is also a gas grill for your convenience. We apologize, but Alone with a View does not accommodate pets. We are happy to provide WIFI. Diamond In The Rough, is a terrific family or group cabin. Diamond In The Rough is a 4-bedroom cabin that will accommodate up to 14 people. Cabin includes 4 and a half baths. Cabin has 3 levels. The lower basement level contains a theater room, pool table, and a air hockey. Other amenities include an outdoor hot tub, gas grill, gas fireplace, water filter system, washer/dryer, paved driveway and indoor whirlpool. It has a fully equipped kitchen with full size refrigerator, range, microwave, dishwasher and dining area that seats up to 12 individuals. THIS CABIN IS NOT PET OR SMOKE FRIENDLY! Cabin is Decorated for Christmas! 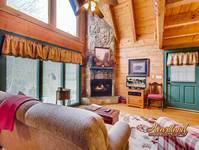 This custom-built log home only 1 mile to the National Park is Second to None! 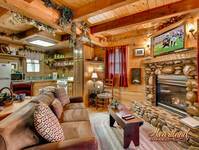 This Gatlinburg cabin rental has large bedroom suites, beautiful decor, and luxury furnishings for the ultimate Smoky Mountain Vacation! THIS CABIN IS NOT PET OR SMOKE FRIENDLY!